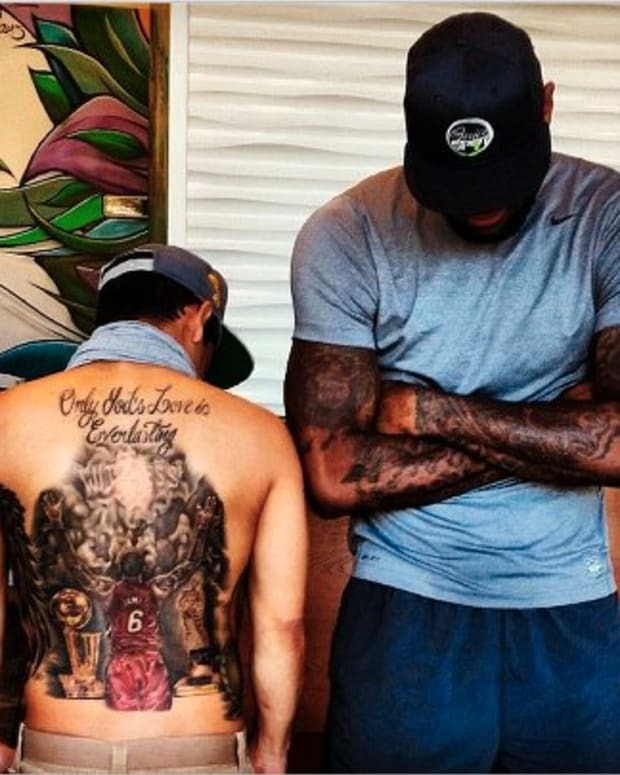 Are the inked NBA players better than the non-tattooed? From the top of the key Derrick Rose is able to get past Chris Paul on his way to the hoop only to find the twin towers of Kevin Love and Dwight Howard between him and the basket. Rose kicks the ball out to Kevin Durant who finds LeBron James streaking toward the basket. As the whole defense converges on James he dishes to a wide-open Steph Curry who effortlessly drains a shot from 27 feet out. No, this isn’t a video game or the fever dream of an NBA coach. It’s us vs. them: a team of tattooed superstars taking on their inkless rivals. 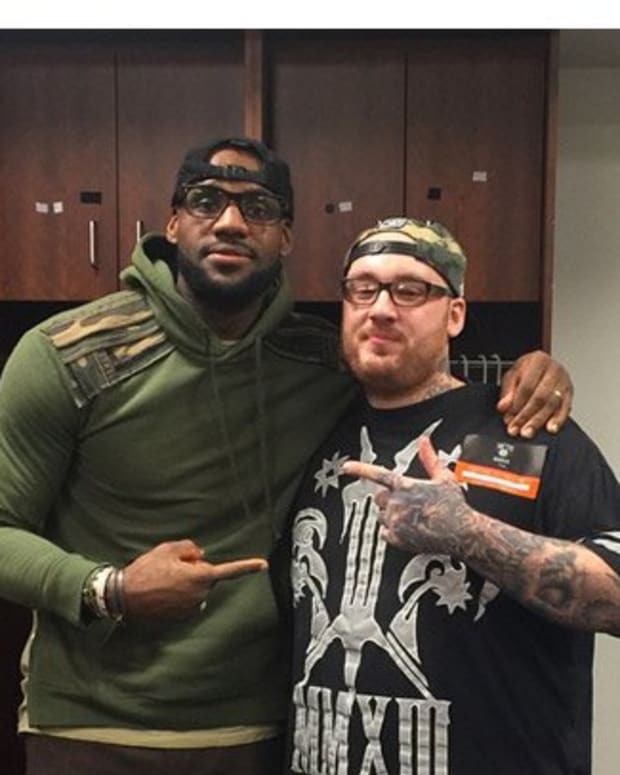 After a seemingly endless summer the NBA has returned and we couldn’t be happier here at Inkedmag.com. We love the NBA. While we do enjoy all of the alley-oops and last-second half court shots like everyone else we particularly enjoy seeing so many of our tattooed brethren on the court. Thanks to the style of their uniforms NBA players are more recognizable than those in other sports; they don’t wear pads, sweaters, or even hats so we can see their tattoos in all of their glory. 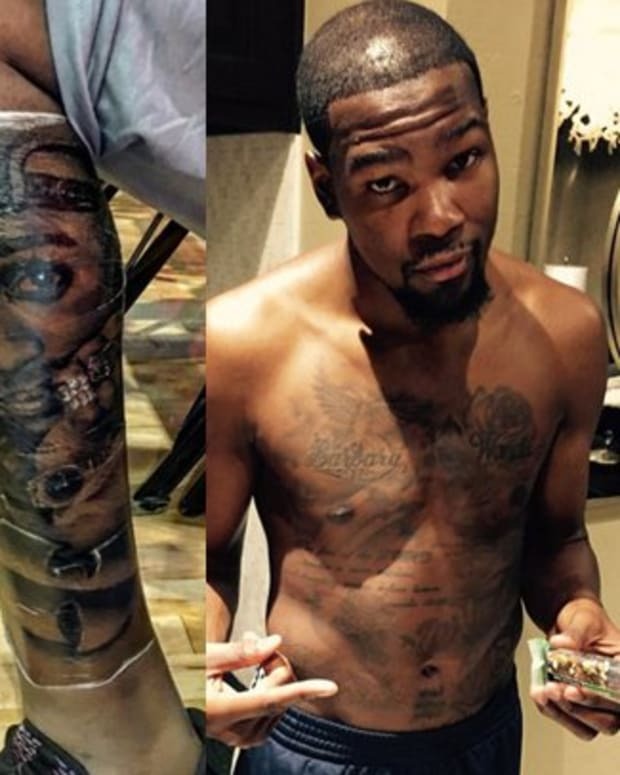 NBA players might not have more tattoos than other athletes but their ink is certainly more prominent. 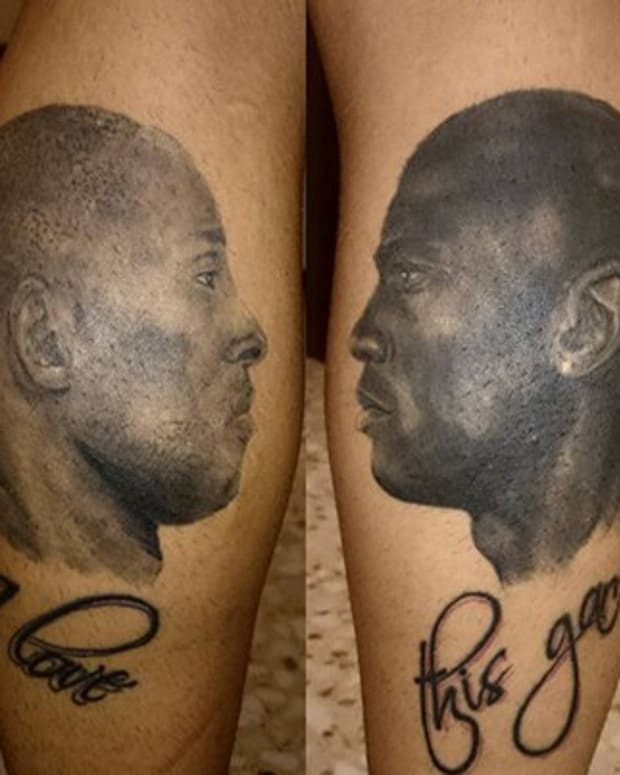 Tattoos are ubiquitous in today’s NBA but this hasn’t always been the case. When Allen Iverson broke into the NBA in 1996 it was immediately apparent that he was going to change the game; Iverson was a point guard who could score. With players like Derrick Rose and Chris Paul in the league now it’s easy to forget how alien Iverson’s game was when he first entered the league. While the change that Iverson made on the court was palpable he had a much greater effect on the culture of the game and arguably the country; Iverson helped make tattoos commonplace within the NBA. Of course, Iverson wasn’t the first NBA player with tattoos but he was definitely the first superstar with ink and he caught a great deal of flak for it from sportswriters. Players like Dennis Rodman were sporting massive amounts of ink prior to Iverson’s arrival but they were never taken seriously. Rodman, while incredibly skilled at rebounding, was a role player and his appearance was treated almost as if he were part of a freak show. The fact that Iverson was clearly one of the top talents in the NBA playing a position noted for leadership forced the NBA and those who covered the league to confront any prejudices they may have had against tattoos. At times the culture clash between Iverson and the establishment got a little ugly. Hoop Magazine, a publication owned by the league, airbrushed Iverson’s tattoos away for an issue in 2000. In a little under two decades things have changed enormously. Looking at the starting five of most teams this season it seems like the tattooed players outnumber the non-tattooed. 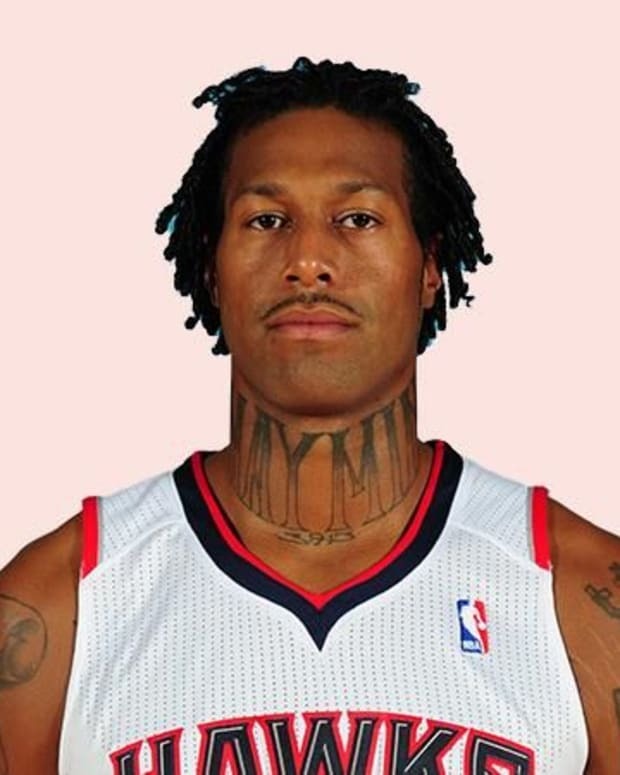 While most aren’t quite as adorned asInkedmag.com favorite Chris “Birdman” Andersen we won’t hold that against them; we welcome all tattooed players equally. 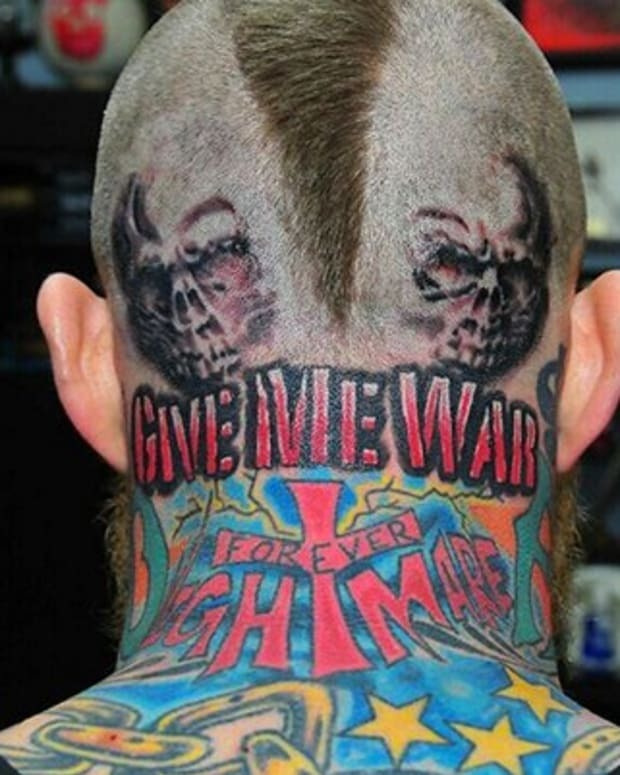 With the ever-rising number of tattooed players in the league we started to wonder what would happen if a team of tattooed superstars faced off against a group of all-stars without ink. In the late 80’s the tattooed team would be laughed off the court, now they have the two best players in the league on their side. So we created two rosters: one of the best tattooed players in the league and one of the best non-tattooed players. For the shirts we looked hard to make sure we couldn’t find any ink, just short of following them into the showers. But we fully acknowledge, actually we hope, that there may be a few guys hiding some ink on the roster. Teams with this much talent don’t really need to be coached but they could definitely use someone to motivate them, a spiritual leader if you will. Who better to lead the Shirts than towel waving extraordinaire Brian Scalabrine? Of course, our friend Birdman will be leading the Tattooed Skins. We also recognize that there is no way that we could give an unbiased opinion about which team would reign supreme so we turned to some NBA experts to get their takes. Looking up and down the roster the two teams are pretty evenly matched; even their payrolls are only $2 million apart. Adam Figman, associate editor of SLAM Magazine, believes that despite the near equal talent the Tattooed Skins have an ace in the hole that the Shirts won’t be able to counter. Actually, they have two aces. While the Tattooed Skins may have the two best players in the world on their side Caplan thinks that the Shirts could exploit a couple of key matchups to gain an advantage. One thing that might be troublesome on both teams, particularly on the Tattooed Skins, is the fact that each roster of 12 is made up of 12 guys who want the ball; everyone in the game is an alpha dog. Caplan thinks that James won’t be looking to bolster his numbers at the expense of winning the game. As insightful as this information was it was still mildly frustrating; we wanted to be able to move beyond pure speculation. Since it would be impossible to actually assemble these teams and have them play we did the next best thing and turned to WhatIfSports.com. What If Sports runs simulations where a user can pit any historical team against any other to see what would happen. The site also allows users to create their own fantasy rosters; which is what we did. We loaded the teams into a What If Sports simulation in order to see who would win if the two teams played each other. For the majority of the players we used their stats from last season, for Kevin Love and Derrick Rose we used the stats from 2011/12 since they were injured most of the season. The Tattooed Skins played out of Madison Square Garden since that’s where Inkedmag.com calls home and the Shirts played at the old Boston Garden. We gave the Tattooed Skins home court advantage in a series that was scheduled to run in the 2-2-1-1-1 format. The best-of-seven series opened at Madison Square Garden with the Tattooed Skins winning 108-104 in a game that came right down to the wire with both teams putting up a lot of points in the fourth quarter. The second game was tied going into the fourth quarter before the Tattooed Skins pulled away to secure a 107-98 victory. LeBron James was named the Player of the Game in both games one and two. As the home team for the first time in the series the Shirts were able to hold the Tattooed Skins under 100 points – the only time either team would be stifled in the series – and win 100-93 behind solid games from Blake Griffin and Kevin Love. In the next game the Tattooed Skins once again used a huge fourth quarter to get a 116-101 victory. Most notable in that game was that Derrick Rose recorded an astounding four blocks – Rose averages less than a half of a block per game throughout his career. This unlikely defensive effort is the only statistical anomaly within the What If Simulation that seemed a bit unlikely. Back at home in The World’s Most Famous Arena the Tattooed Skins were able to wrap up the series in five games with a 117-108 victory. The Shirts couldn’t make a shot to save their lives from deep – they went 3/17 on 3 pointers – and were unable to extend the series. James scored 23 and received Player of the Game honors for the fourth time in the series. With the exception of a close Game One and one good performance at home from the Shirts the Tattooed Skins were dominant as they cruised to a four games to one series victory. An additional thing that was made quite clear in the simulation was that one player mattered significantly more than everyone else in determining the outcome; LeBron James. James was named the Player of the Game in all four of his team’s victories while the Tattooed Skins lost the one game in which he had a subpar effort. 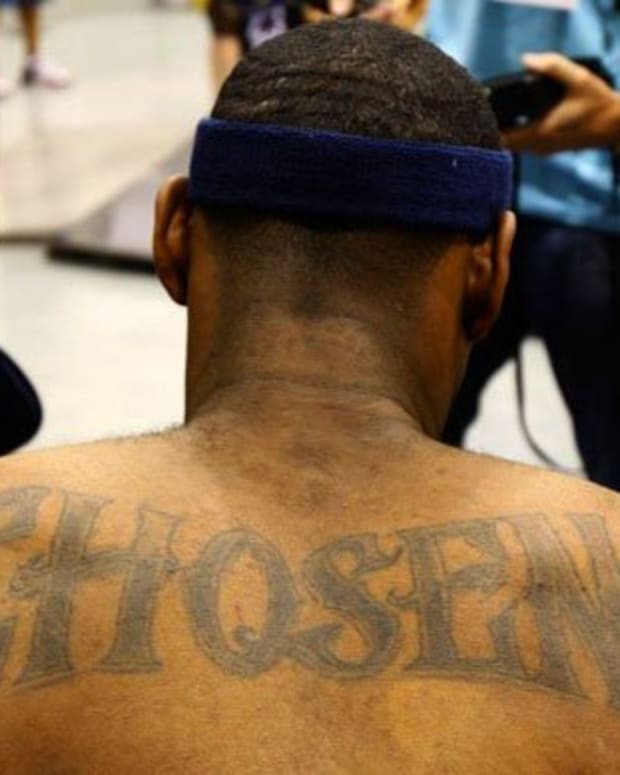 After all of our effort to construct rosters that would mesh together for both teams and arguing over the style of play that would best suit each roster as we searched for answers it appears that the key to ending the tattoo/non-tattoo argument was staring us in the face the whole time and his name was LeBron. With all of the dust settled and the Tattooed Skins crowned as champions it turns out that everything played out exactly how former Boston Globe columnist, ESPN pundit, and long-time Celtics beat writer Bob Ryan told us they would.